This one is destined for our etsy store. 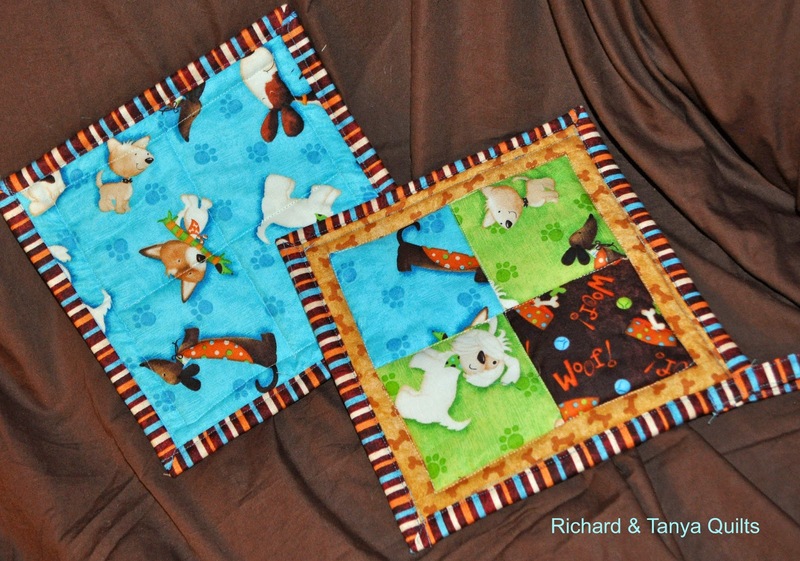 It was funny for a while we had lots of girl quilts so we started making boy quilts. 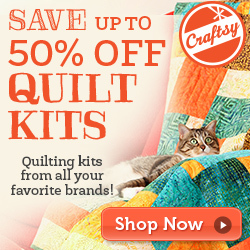 Now I am at the point I have lots of boy quilts and need to work on girl quilts. All in all this is a fantastic finish. Today starts out with me still cutting the blocks? Did I not end there yesterday? 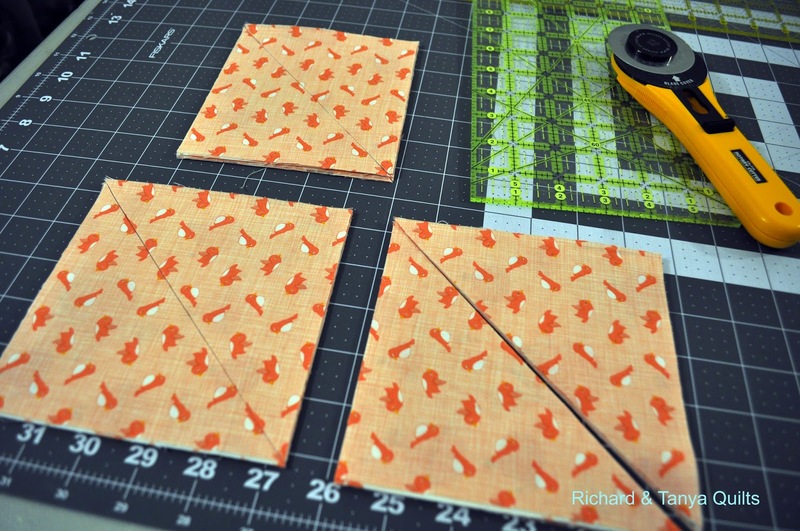 Oh well had some more to cut. 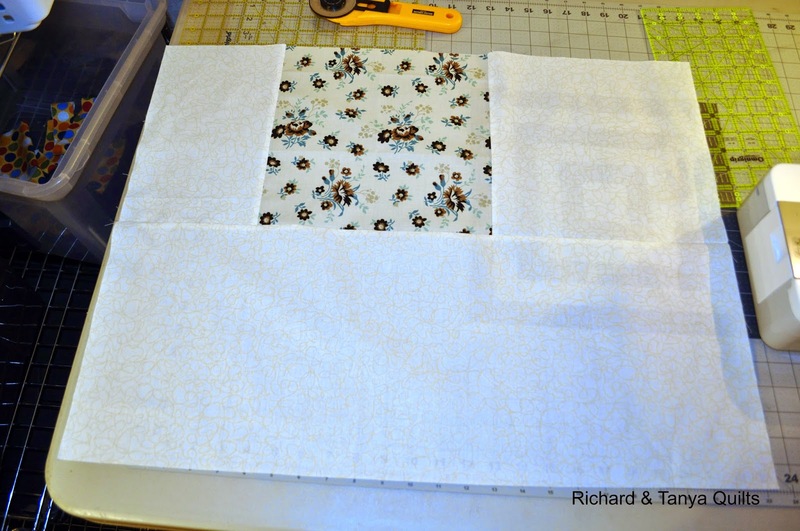 Oh now I know what I am doing it seems that I am going to make 2 really simple quilt tops just made out of just 6 inch squares. 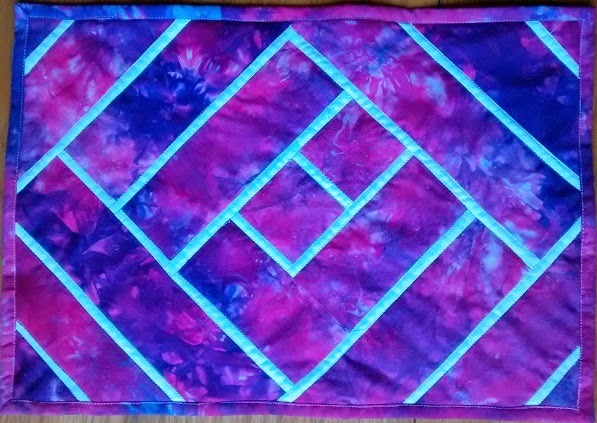 I told Tanya that it was too simple and boring I like to cut things into smaller pieces before I sew them back together but as a good husband I did what I was told. when this day was finally over. 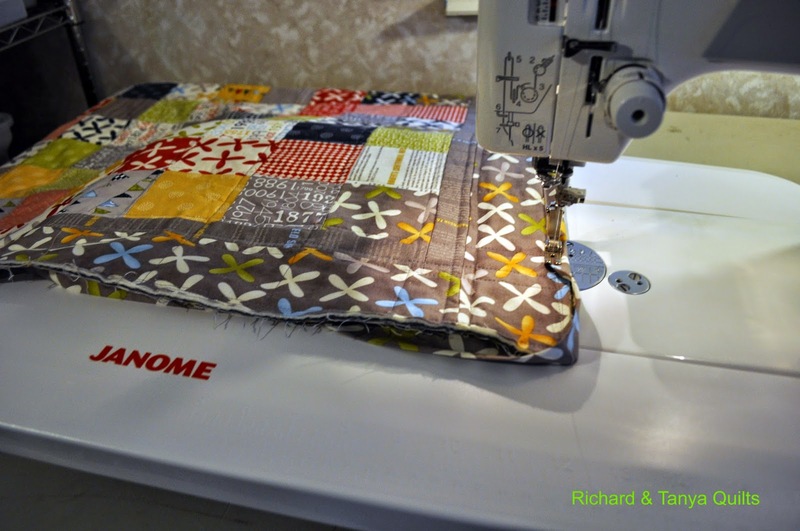 Today on the Quilting table we have one of my reunion quilts being bound. While I guess I have to trim it first. 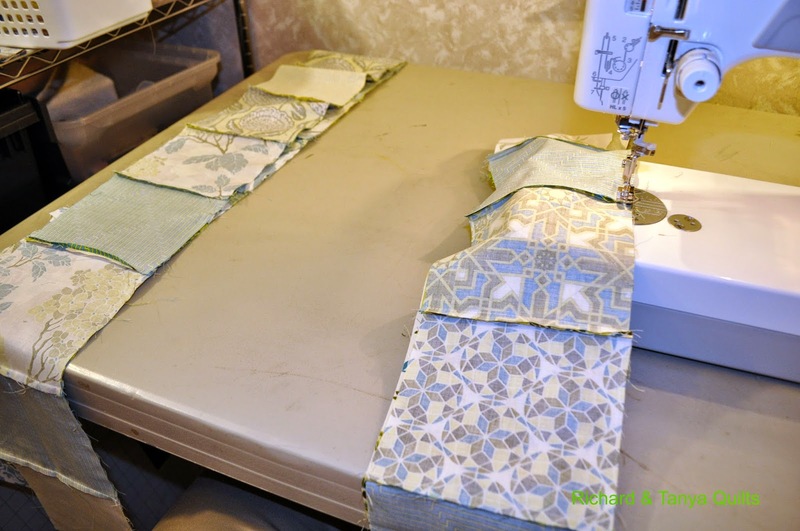 When I first started quilting I totaly dreaded binding. 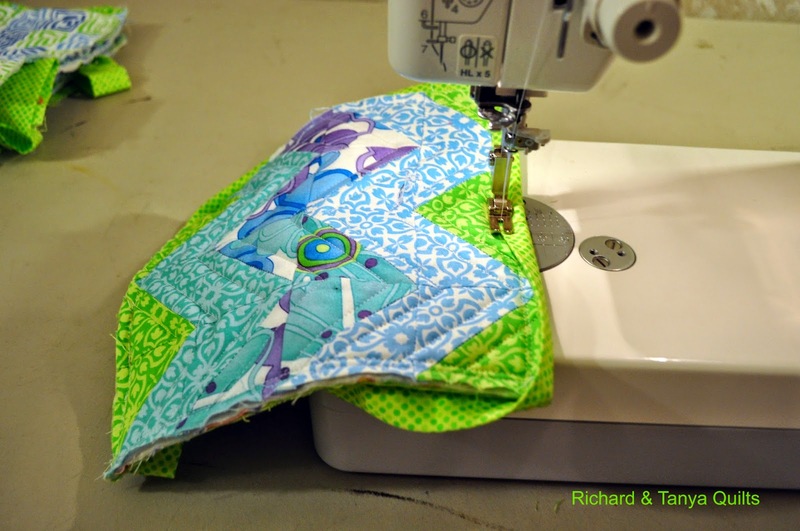 After the hundreds of quilts I have done its secound nature it now takes me more time to cut and iron the binding then it does to sew it on. 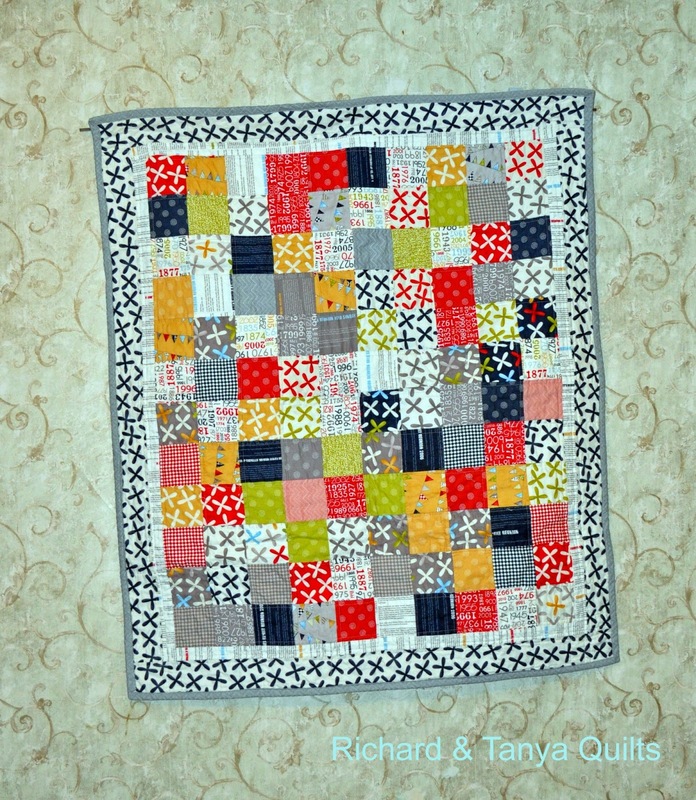 This 2nd quilt on the table today was pieced by Tanya. 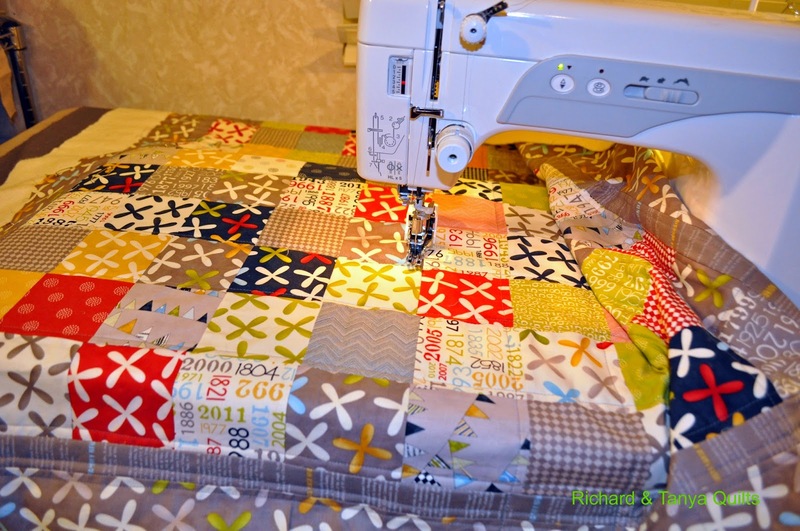 I am not sure what pattern she used for this quilt but it was a great way to use up many scraps we had in the bin. 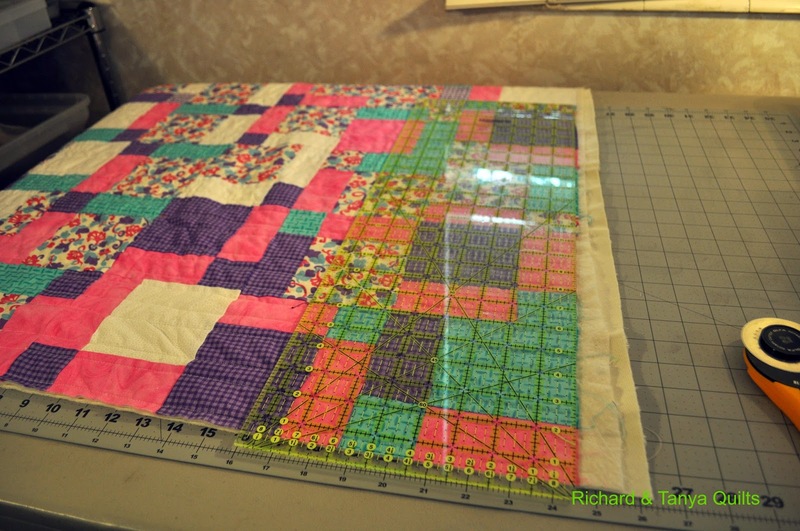 After timing up this quilt I also bound it. 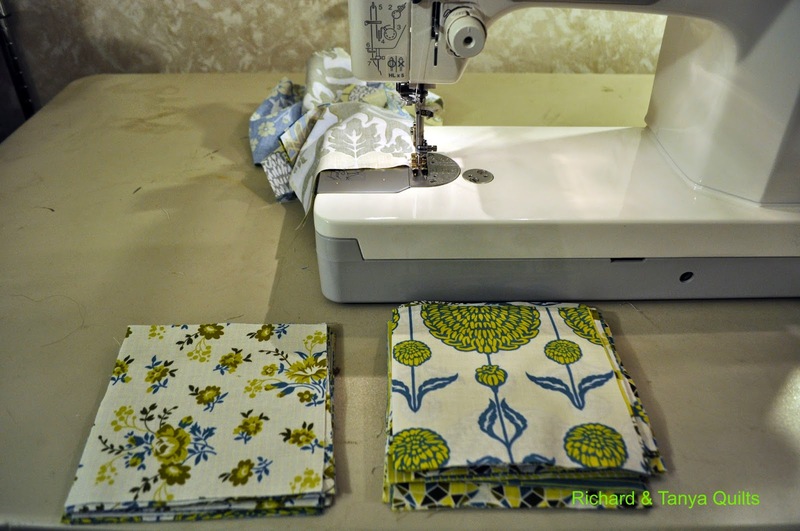 Tanya handed me a stack of fat quarters and told me to cut them into 6 inch square so I did no questions asked. What do you think she plans to do with them? She never tells me so who knows. In our house I cut and she bastes. Thats our rule and it works well for us. 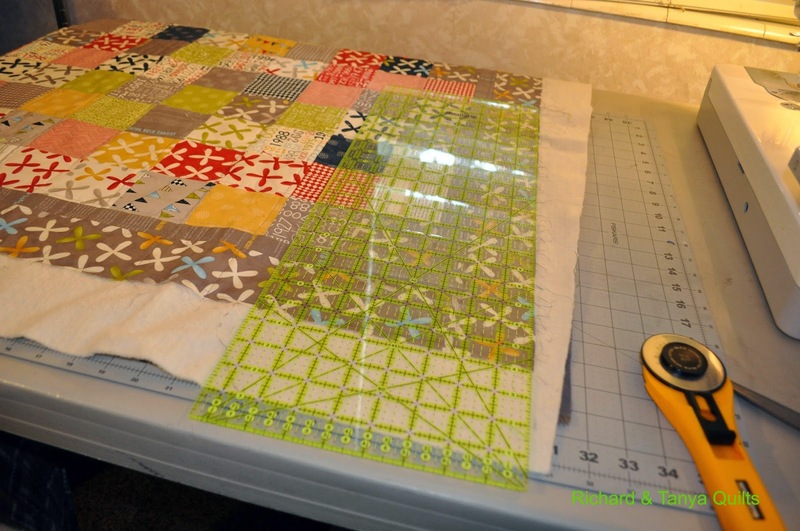 This is one of my favorite quilts for using up all the little scraps I have left over from other bigger projects this quilt is mad out of 3 1/2 inch blocks and works great to use up the odd ball fabrics. Cant wait to get some good pictures of these and post the finishes look forward to this in the next few weeks. You ask why it might take weeks? 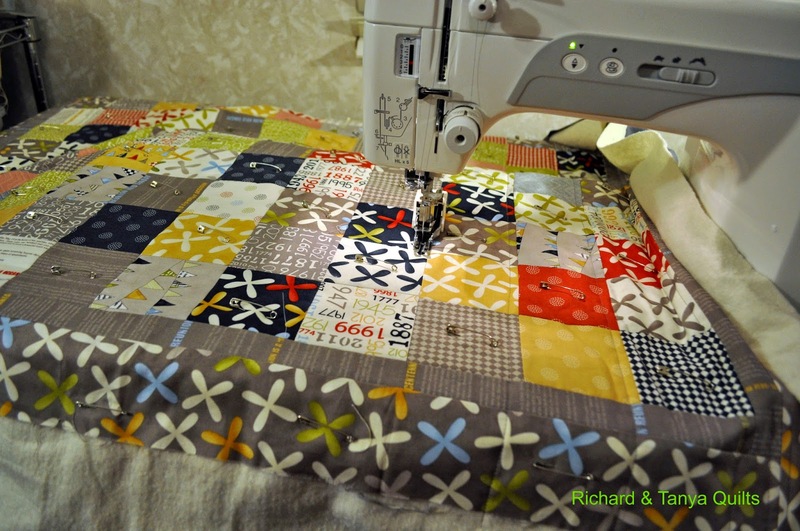 Well I have finished about 15 quilts that I have yet to blog about. Yes I am a slacker. wow I just realized before heading off to work that it was Friday and I totaly forgot my LAFF post. So here it is. I am not able to spend the time now to put in pictures from last week but will try to later in the day. 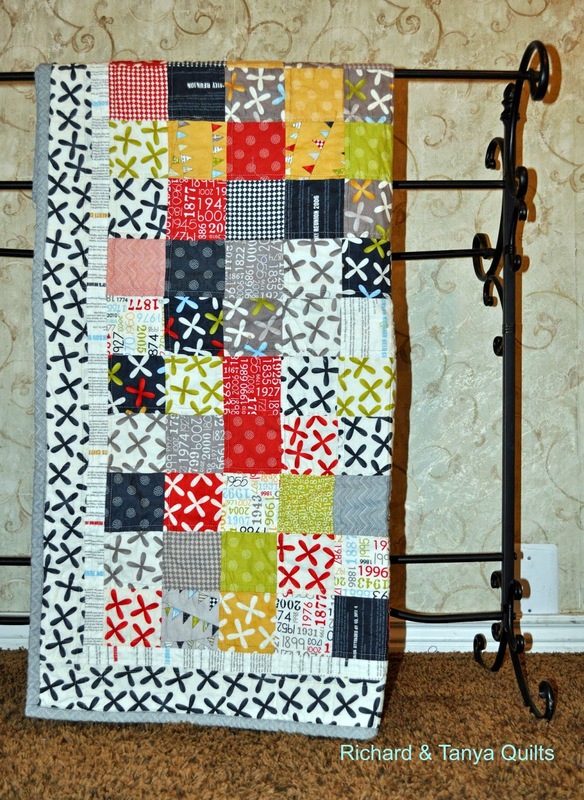 Here at least is a picture of a quilt top to tide you over. While today's WOQT come's at a cost. The cost is my keyboard. When I sat down to type this out I realized the keys on my key board were a little wet. I picked it up and about a cup flooded out of it. Any way I had to steal my wife's keyboard off her computer to make this post (oh and re-boot my computer 3 times) so It is going to be just 3 pictures. You are just going to have to guess what it is. 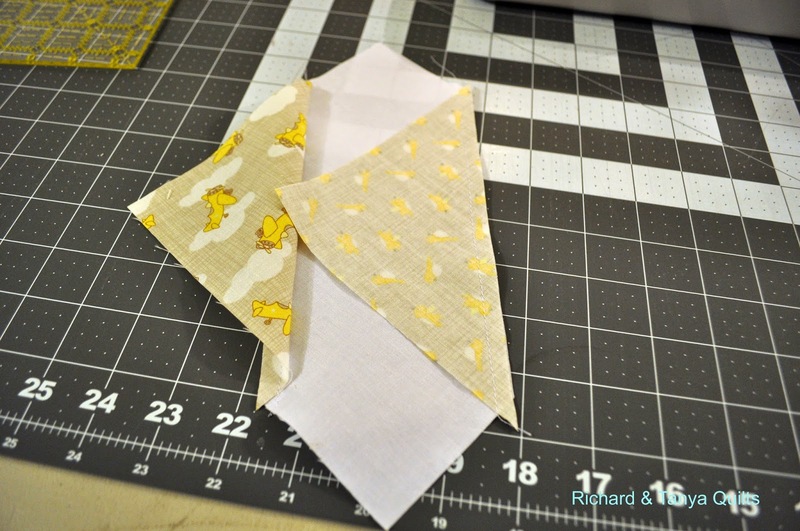 One hint baby quilt, new design pattern will be created and shared when done. 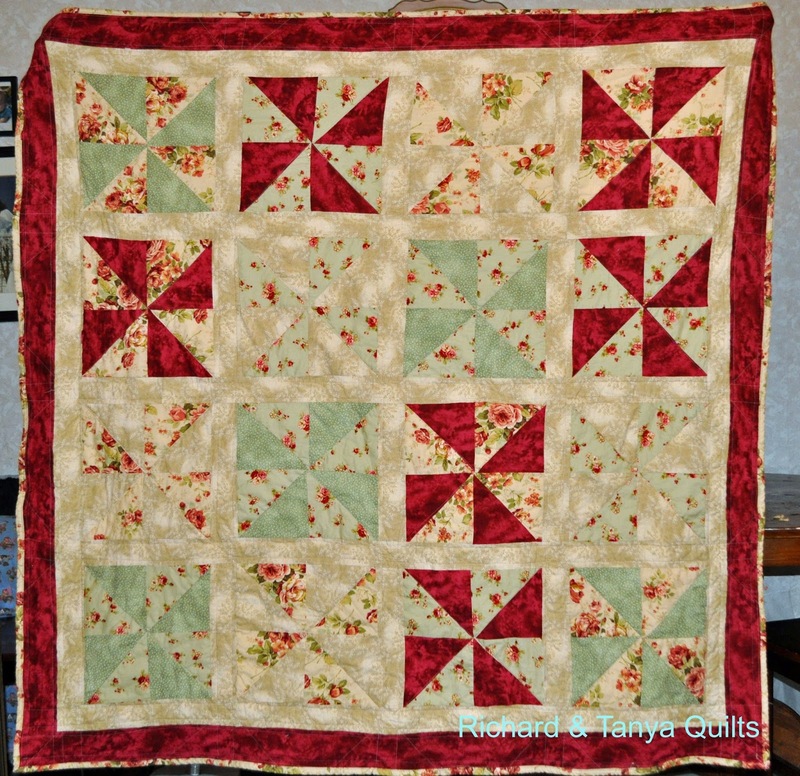 Oh and this is a Tanya design not a Richard design which might be why I was cursing trying to make the block she has in this pattern but boy oh boy its looking cute. 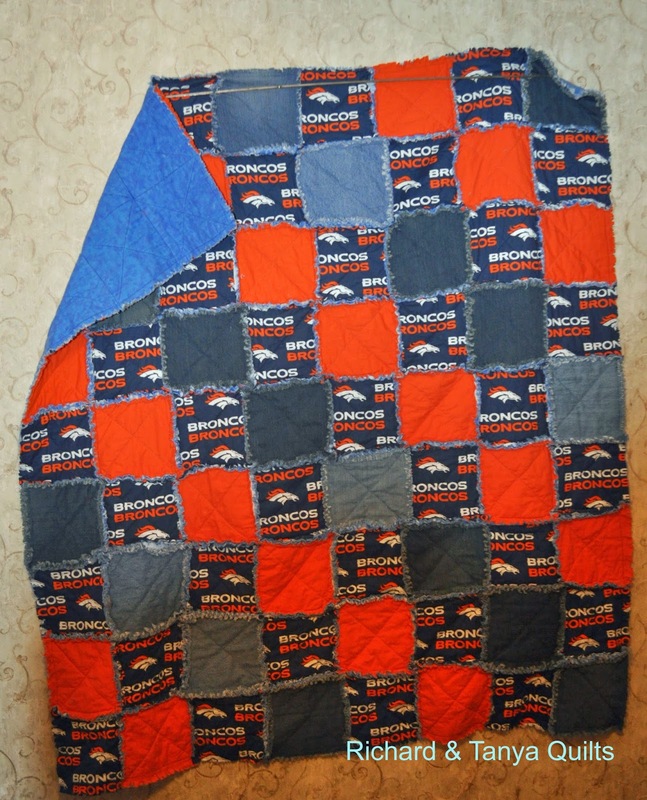 Oh ya and this is the boy quilt I am making. There is a girl version also. This was a Christmas gift for another nephew. 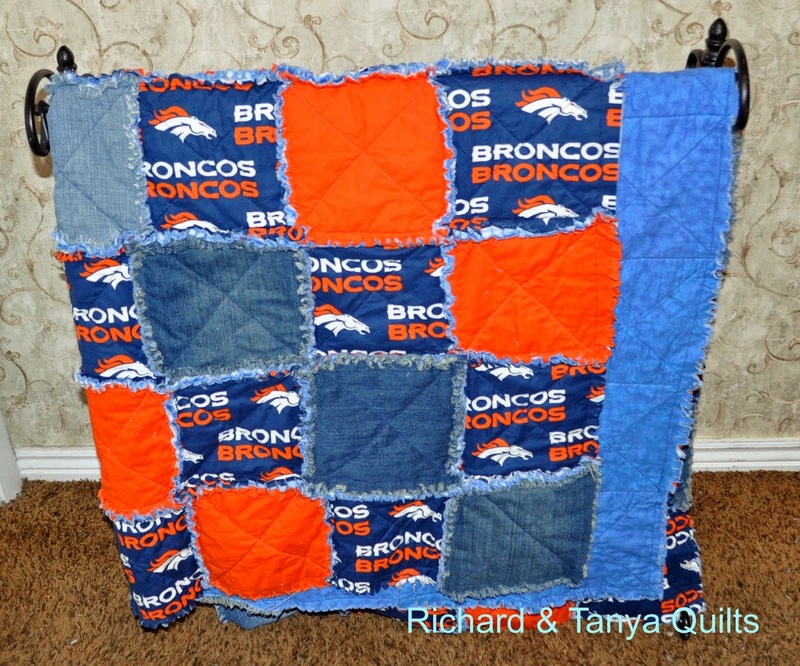 We paired it with denim and a orange cotton. I know in the pictures it does not look orange but you are just going to have to trust me that it is. This is another post that was meant to be posted last year and well got put off, but it was loved when it was received. Having another color, instead of just Bronco Fabric and denim helped keep the weight to a more reasonable weight. 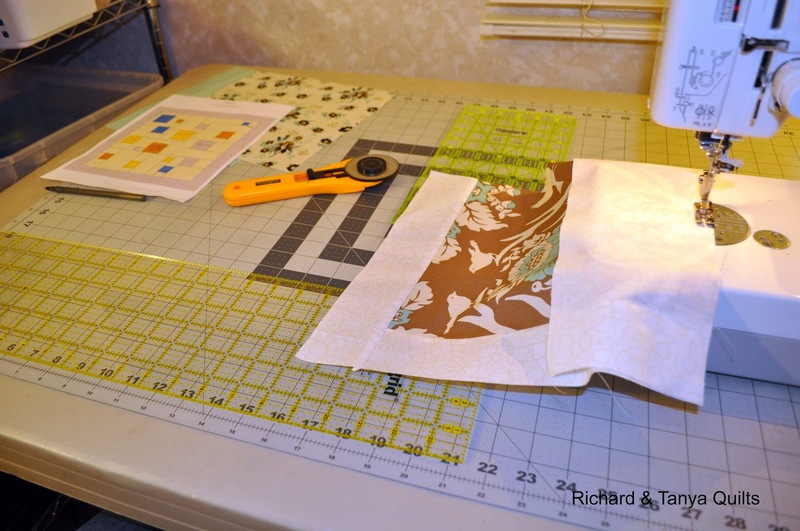 Today's whats on the quilting table is going to take a different tact. 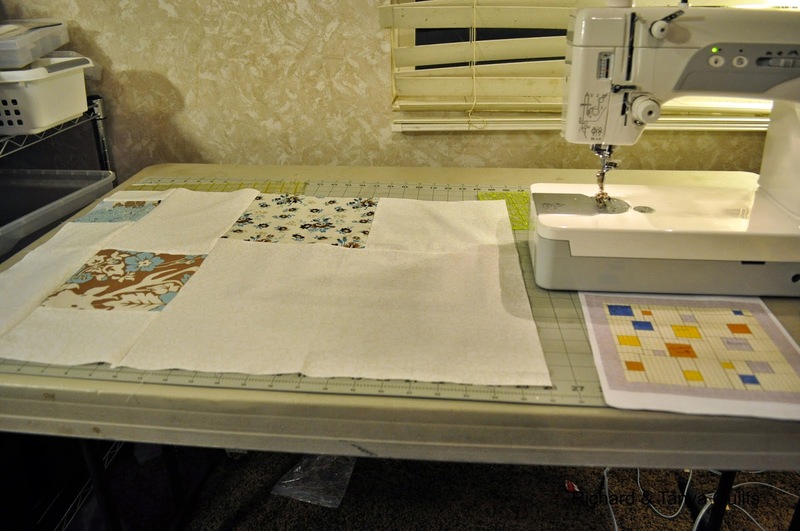 I have so far posted mostly in order the pictures I have taken while quilting. 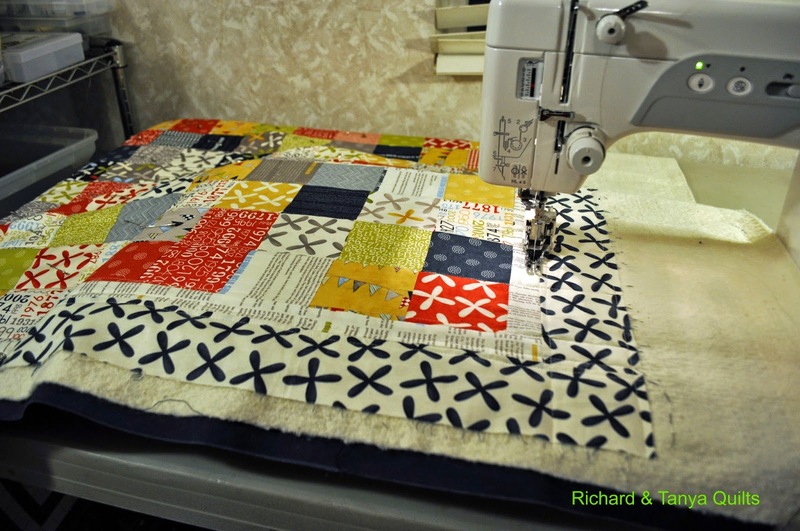 As this quilt is a little more special I have a seprate post for it, but if your interested on the time line the first 3 pictures of WOQT #5 was taken before this quilt I am about to show off, but the last 3 pictures were actually taken after it. But hey who cares if I go a little out of order. 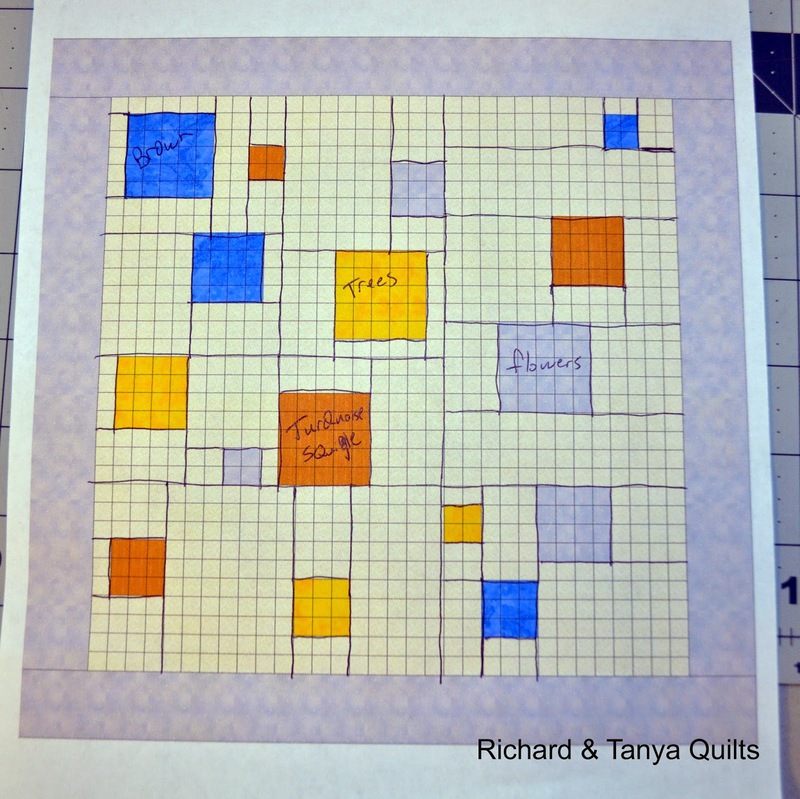 Here is a print out of my quilt design (the lines drawn all over the white area is to represent the pieces I would sew together it was a huge puzzle). 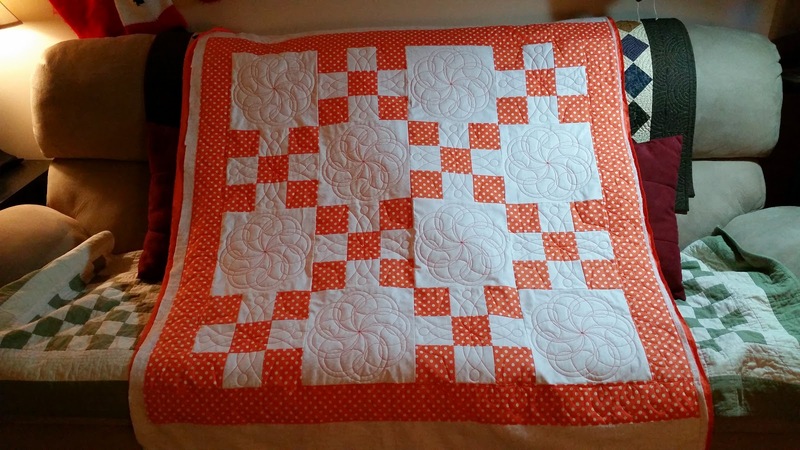 Well one thing that I sorta messed up on up front is my dimensions, I was planning to make a baby quilt. I put some generic blocks into the program and free handed the blocks I was going to add. Oh I guess I should point out is this picture needs to be flipped left or the top picture flipped right to line up. 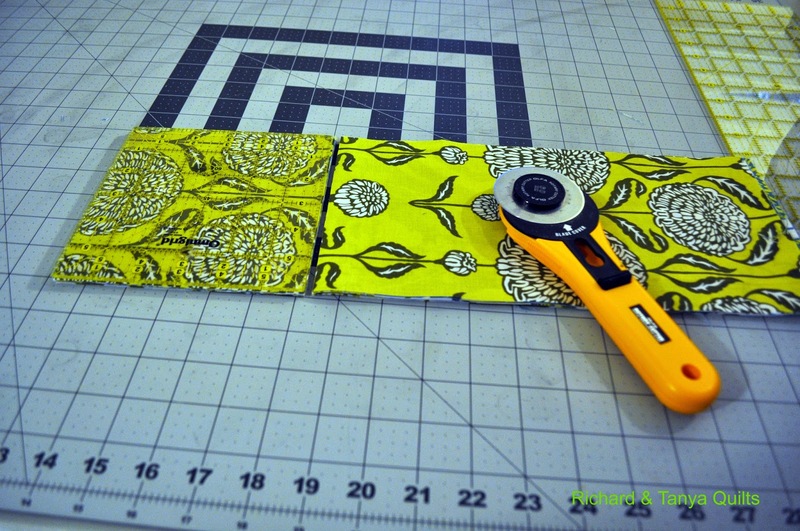 Any way I had in my head that each block on my picture above was 2 inches. 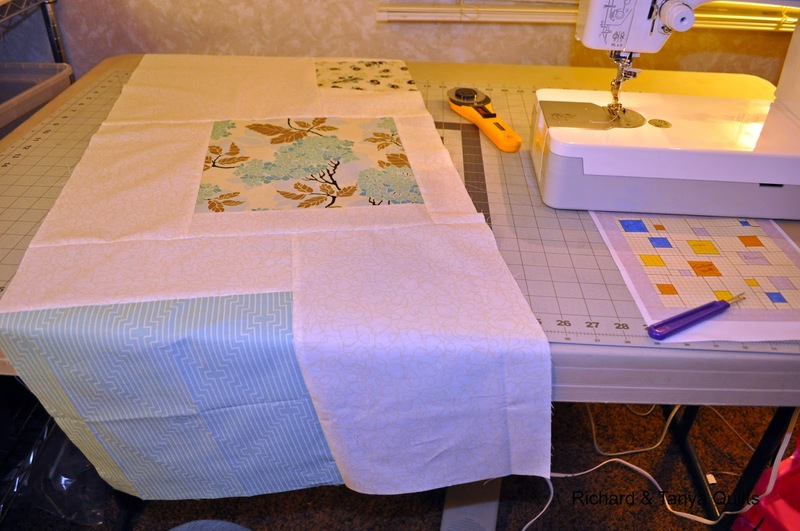 I had planned for a baby quilt of around 44 inches square. 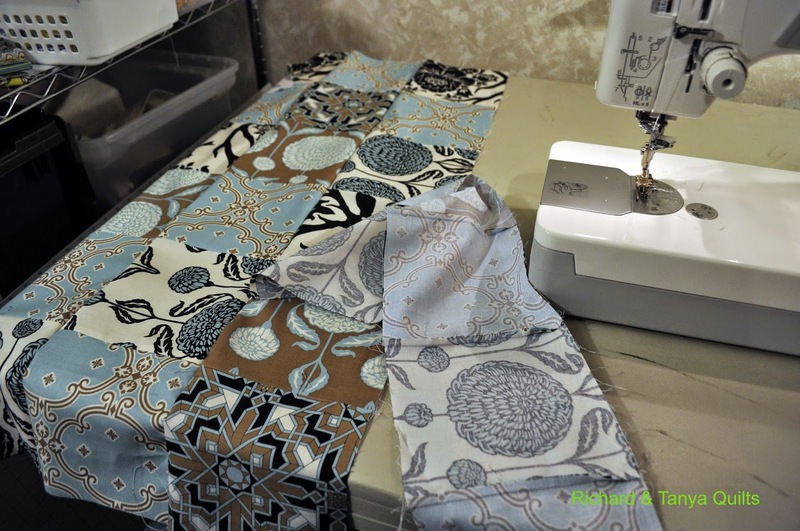 And sewing and sewing and sewing. And it got later and later and later and later. Any way I around 3 am ( I started at 9 pm) realized that I had some sort of problem. Hum this thing looks tons bigger then I had envisioned it in my drawings. 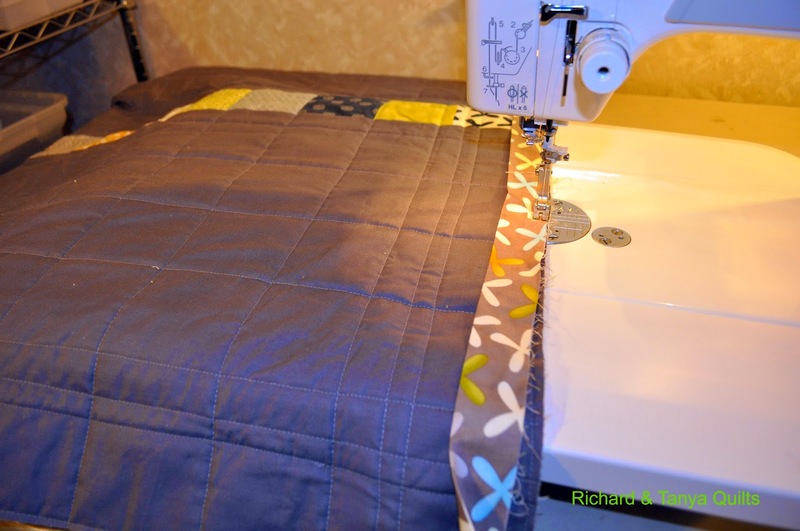 I finished my quilt at 4 am and went to bed. 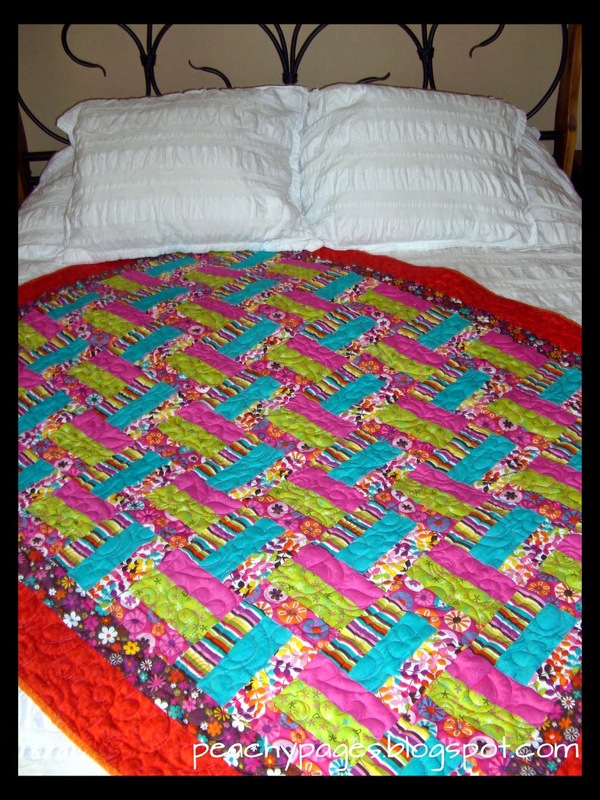 When I woke up in the morning I showed my wife my 58 or so inch baby quilt. 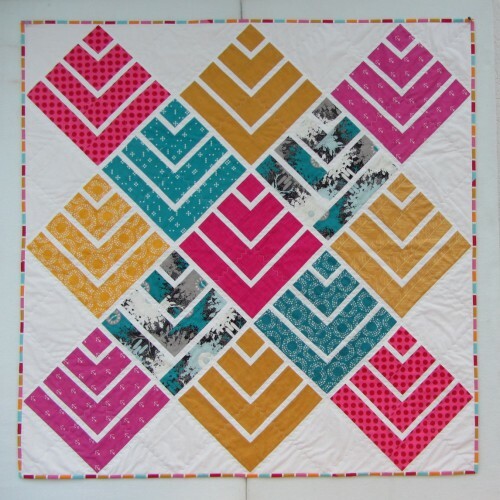 Ok well, maybe not a baby quilt. Any way, Tanya laughed and she asked me what I did wrong. 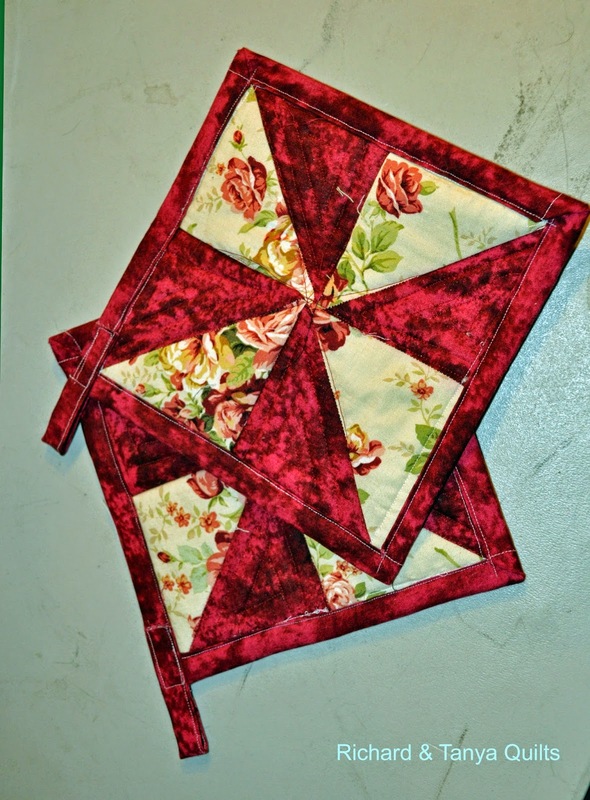 LOL I quilted too late at night, When I designed my quilt I said that my blocks were 6 inch blocks and then I made them more like 12 inch in size. Oh well, I think it turned out cute, but it does give you a chance to laugh at me. 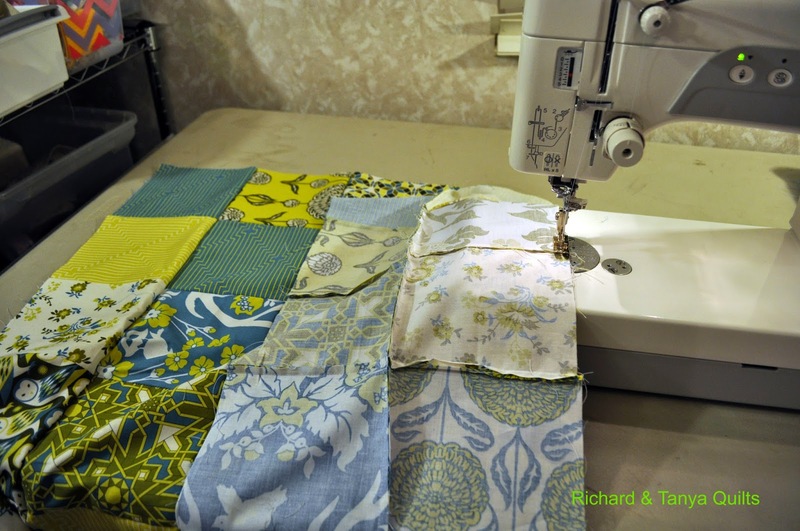 Oh and as I have said in the past I always make 2 or more tops at a time. 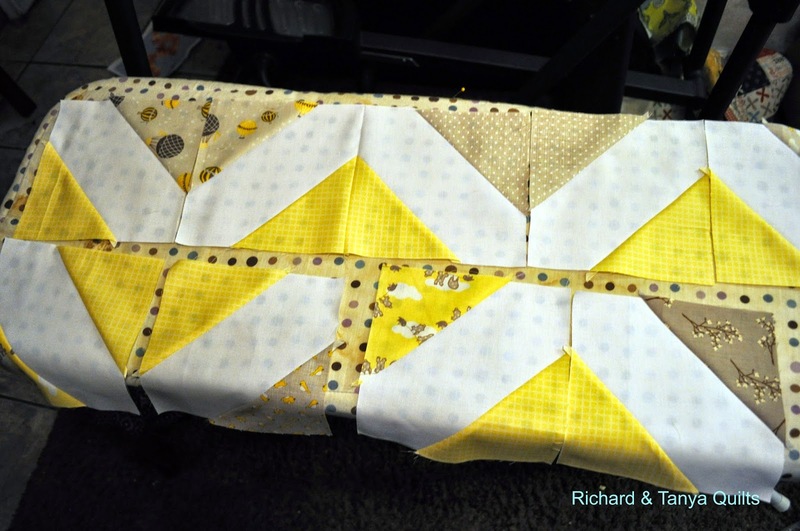 I have the colored squares cut out for the 2nd "Modern Baby Quilt" that is more like a modern lap quilt. 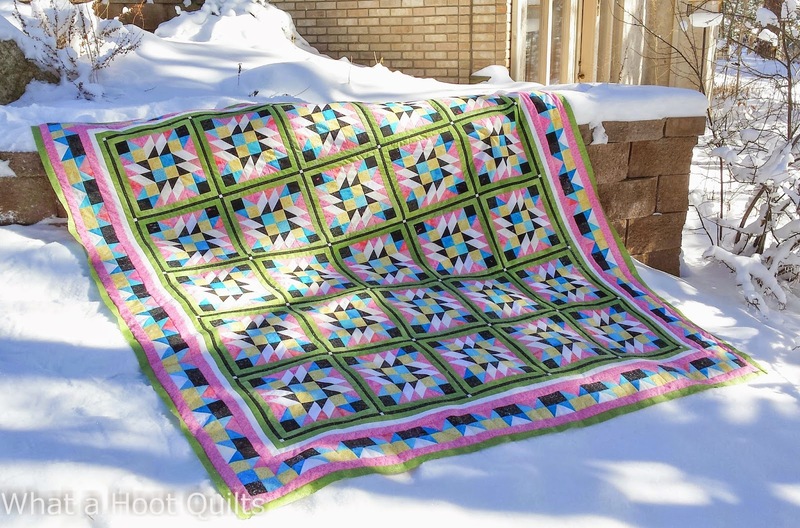 Ha ha, I think the thing that really bugged my wife most is that the back she ordered for the 2 quilts will almost cover the back of the 1 I made with no room left over. So she has to go shopping again. 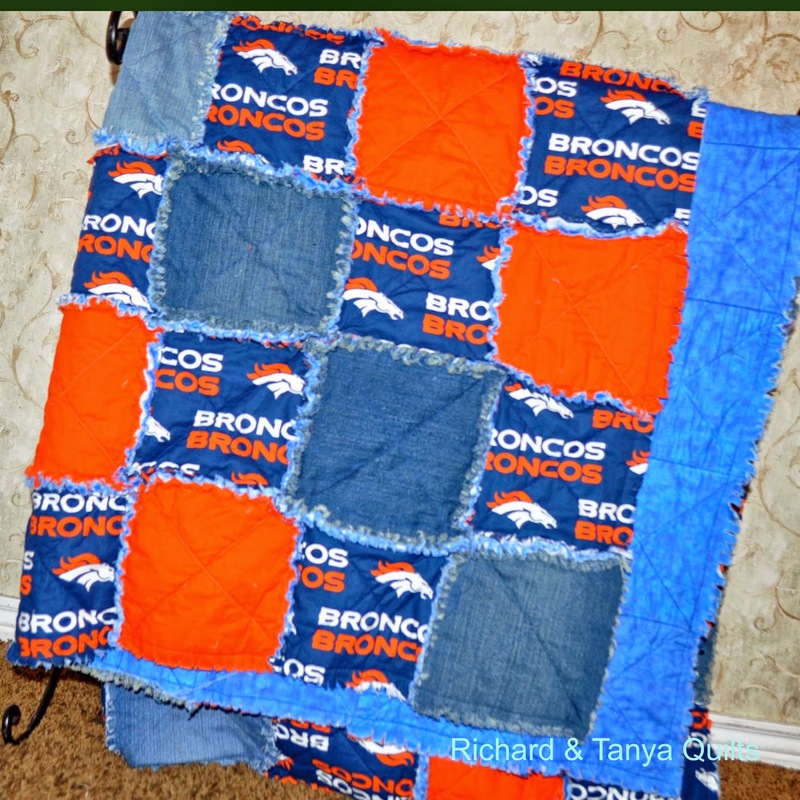 This is a quilt that was made for Tanya's mom. Two years ago my mom was in Salt Lake City when she had her leg amputated. 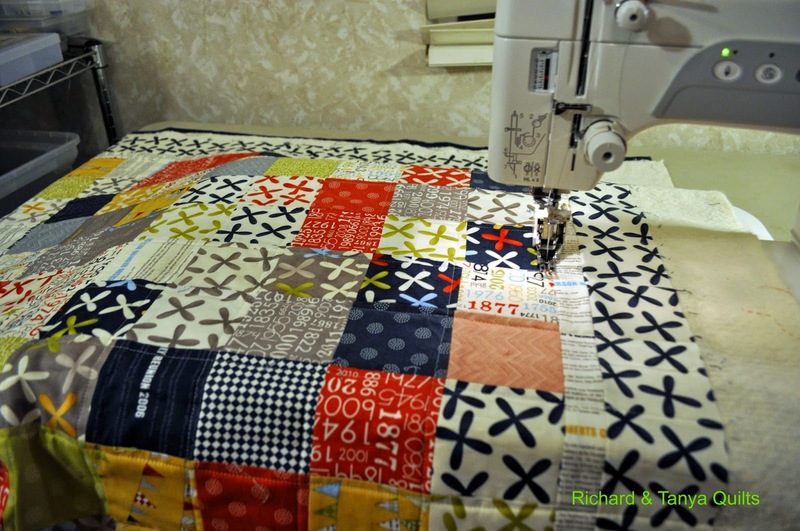 We ended up never getting her quilt started let alone done, because we spent the time with her instead. 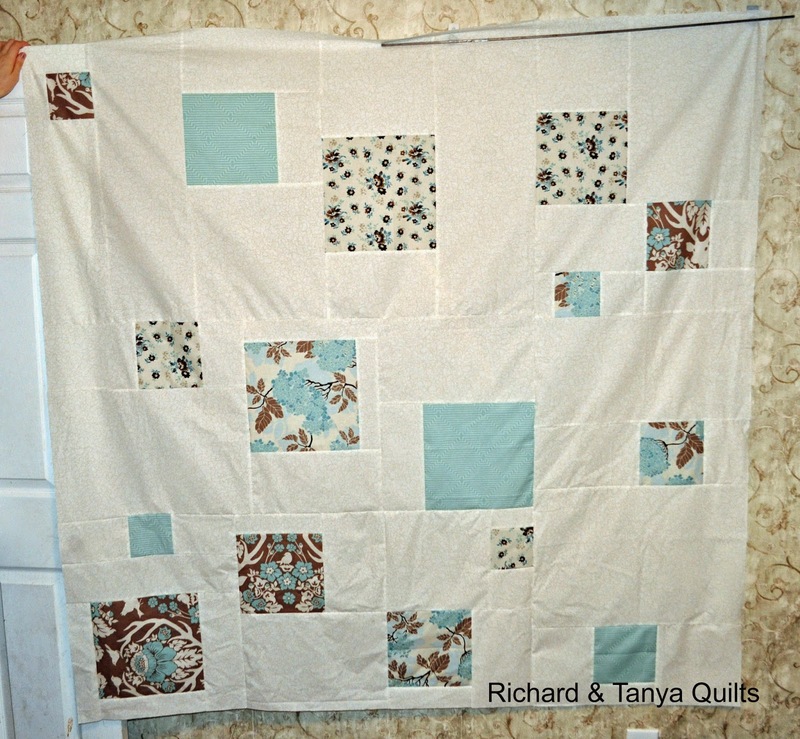 This was pieced by me, Richard told me it was my mom, so it was my project. 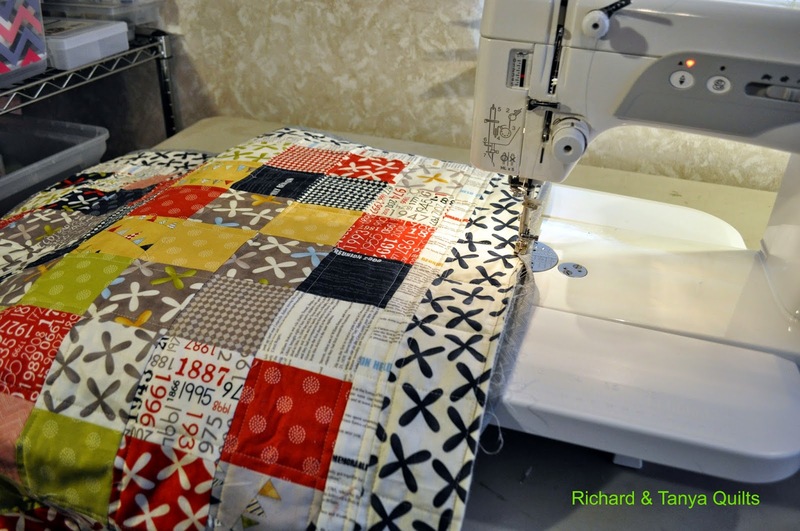 He did quilt it. 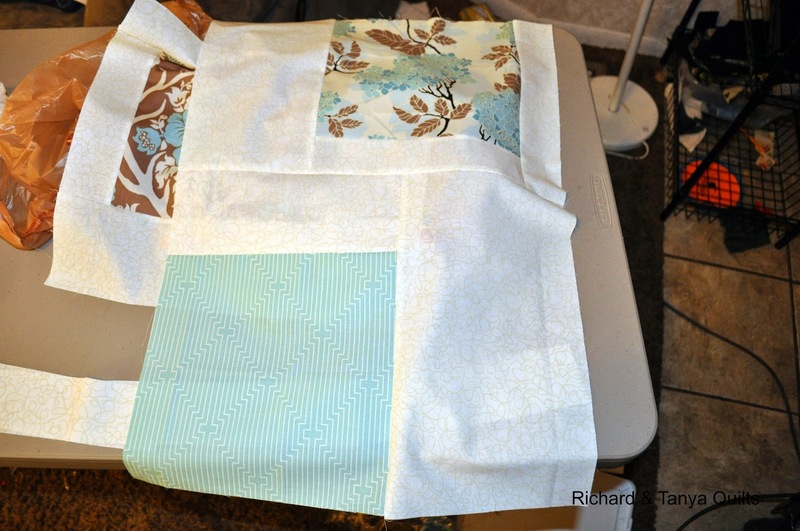 I struggle with getting a good 1/4 seam, so a few places were zig zag to fix problems found after washing. 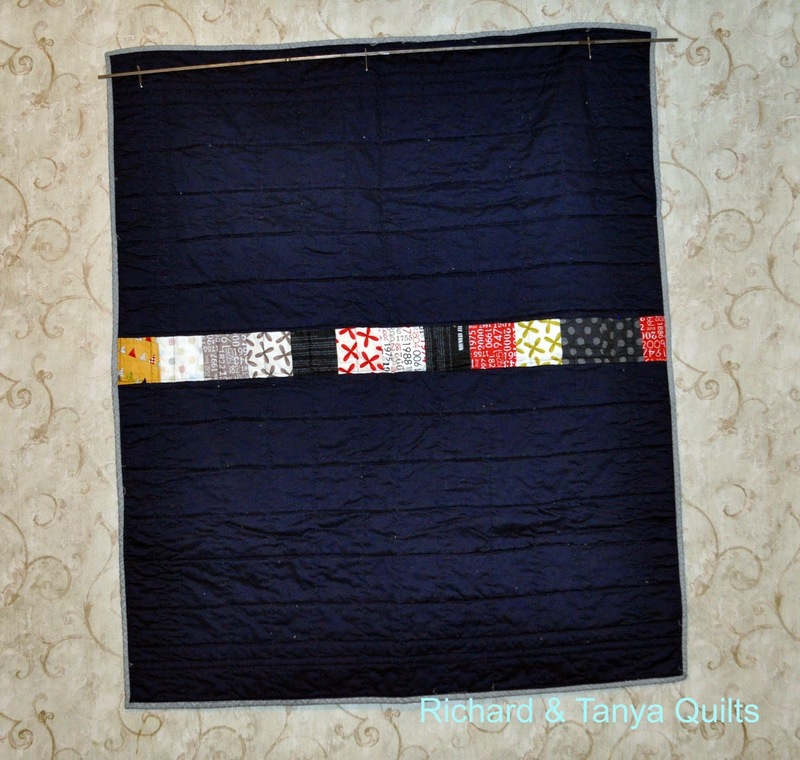 Richard did quilt it and bound it. We gave it to my mom at Thanksgiving. She has been sick with Pneumonia three time this year, so I wanted her to see it, in case something happened. I haven't had the best luck the last few years with families health. She really enjoyed it and was brought to tears. 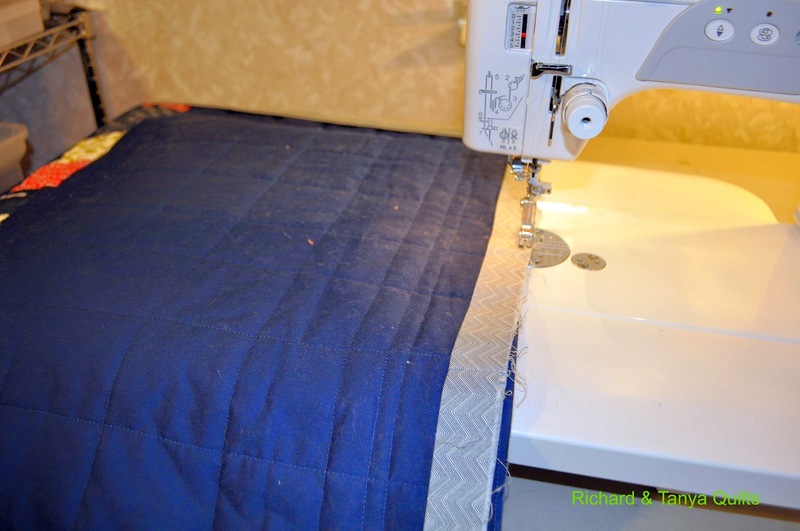 It is a good size lap quilt. This post was started by Tanya last year and its time to finish it and get it posted. 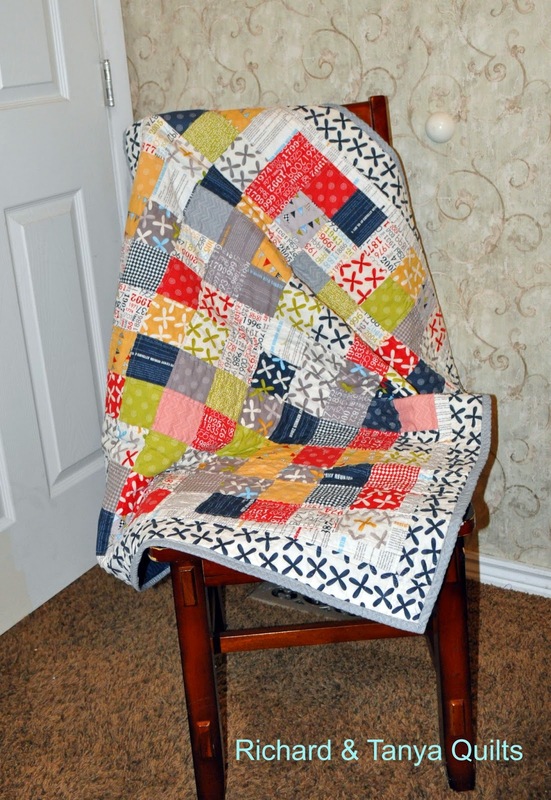 I have since heard from my mother in law that this is a cherished quilt and has put it up so that the grand kids can not get it dirty. 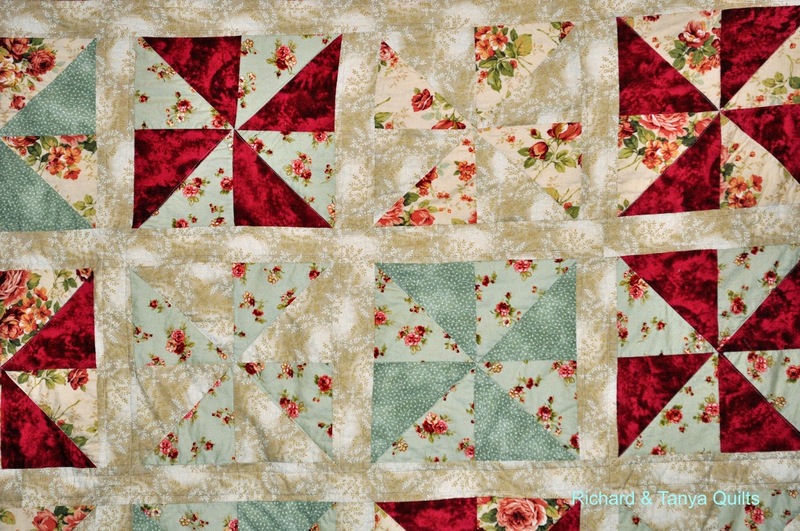 I think it meant more to her knowing that her own daughter pieced the quilt. 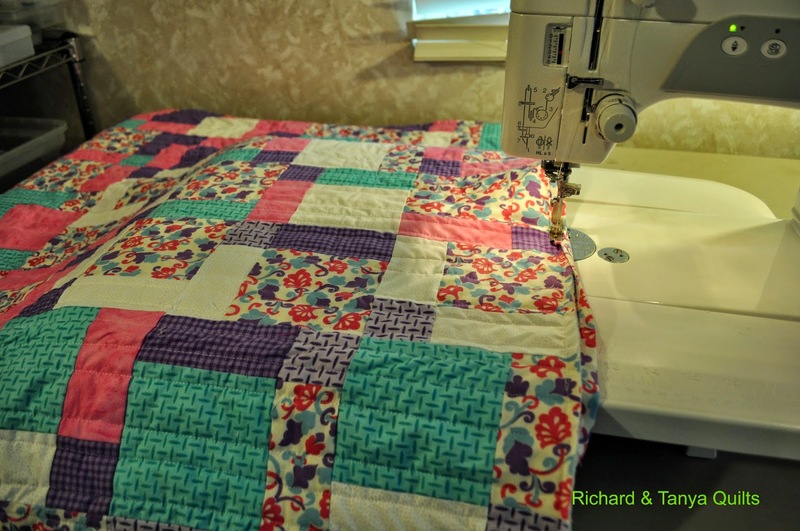 It is not a perfectly pieced as some of the quilts I have done but it was done with love from her daughter. Give Tanya a big hand for this fantastic finish. 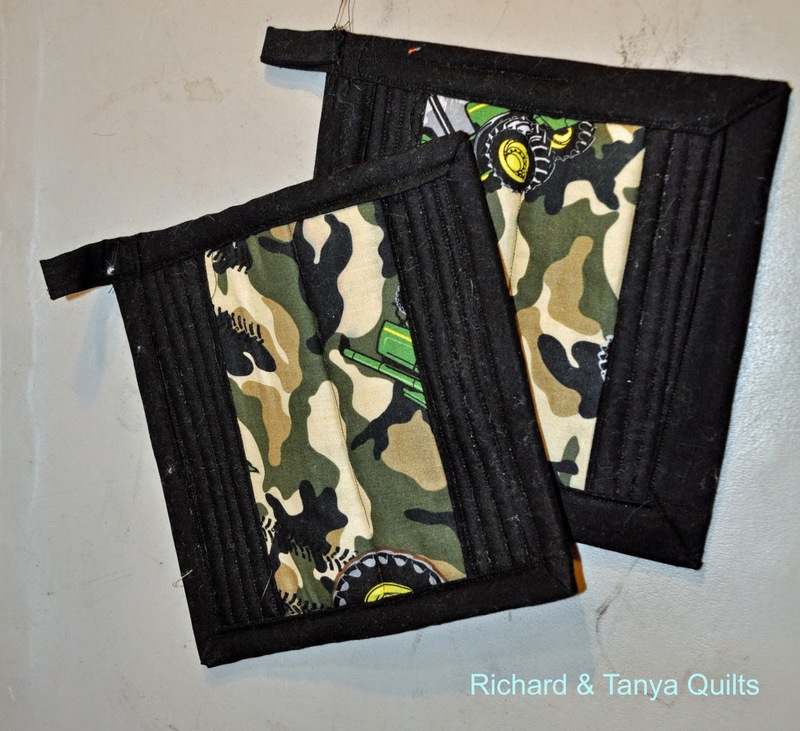 We decided to do hot pads for family members last year for Christmas along with some homemade jam. We normally don't do loops, because we couldn't figure out how to do them. After several tutorials, we decided we need to do a bias type binding. After ironing them manually on a couple, I decide that was a joke and we invested in a bias tape maker. We also are trying to do some hot pads out of linen for someone and they are not working out at all. We broke or bent 4 needles trying to bind them. The linen combined with Insulbrite is just too thick. Here are some of them that we remembered to get pictures of. There were many more, but like our 12 days hot pads we sorta jumped the gun and sent out all the presents and forgot to take pictures first. Oh well hope that you enjoy these. Almost forgot to share this!